Not to be confused with Florida Atlantic University. 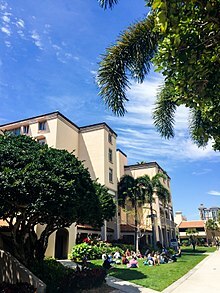 William "Bill" M. B. Fleming, Jr.
Palm Beach Atlantic University (PBA) is a private Christian university in West Palm Beach, Florida, United States. The university's nine colleges focus on the liberal arts with a select collection of professional studies. In 2017, its undergraduate enrollment was approximately 2,200. Founded in 1968, the university grew out of a local Baptist church. It operated out of assorted buildings until the first purpose-built campus building was completed in 1982. A subsidiary campus operates in Orlando. Eighteen sports teams represent the university in NCAA Division II competitions. Dr. David W Clark, President of FamilyNet, and founding provost of Regent University became the sixth President in 2003. During his presidency enrollment grew from 2600 to 3291. Five new buildings were completed including the magnificent Warren Library, a mini campus in Wellington was built, and 96 acres (390,000 m2) for a new athletic campus were acquired. The university budget grew from $43 million to $73 million. Over 4,600 or 40 percent of all degrees were awarded during his tenure. President Clark announced his retirement during the 2008-9 academic year the end of June. On March 10, 2011, William M. B. “Bill” Fleming, Jr., the university's vice president for development, was named interim president by the university's Board of Trustees. After a nationwide search Fleming, who had served as interim president for more than a year, was elected by the trustees as the University’s eighth president, beginning his presidency on May 8, 2012. PBA's campus is located in West Palm Beach. The first structure built specifically for PBA, the W.G. Lassiter Jr. Student Center, was completed in 1982. This was followed by Johnson Hall and Sachs Hall in 1989. A new campus was established in Orlando in 2002 and in Wellington in 2002. The Wellington campus ceased operations in 2017. A permanent home for Sailfish athletics is in the form of a 78-acre Marshall and Vera Lea Rinker Athletic Campus at 3401 Parker Avenue in West Palm Beach — just a short drive from Palm Beach Atlantic University. The campus, located between I-95 and Parker Avenue just north of Southern Boulevard, provides facilities for training and hosting intercollegiate and intramural and club sport competitions. The facility opened in September 2014 and was completed in August 2017. The athletic campus includes lighted competition baseball, softball and soccer fields, an intramural softball field, Mitch Gornto Tennis Center with 12 match courts and one championship court. Outdoor basketball, racquetball and sand volleyball courts are to be completed at a later date. Palm Beach Atlantic University has five centers of excellence that provide opportunities for students to gain expertise in their given field. The Titus Center for Franchising: Titus Center offers academic coursework, internships, job shadowing and training at area franchises, including the global headquarters of United Franchise Group in West Palm Beach, Florida. Dr. John P. Hayes is the Center’s director. ^ "Palm Beach Atlantic University's new president has controversial past". Palm Beach Post. Archived from the original on November 16, 2009. Retrieved January 14, 2017. ^ As of March 22, 2017. "Palm Beach Atlantic University About PBA". Palm BEach Atlantic University. Retrieved March 22, 2017. ^ "College Search - Palm Beach Atlantic University - PBA". Retrieved March 22, 2017. ^ "Campus Community Gets First Glimpse of New President". ^ "University President Lu Hardin Resigns". ^ Brantley, Max (March 7, 2011). "Lu Hardin pleads to wire fraud, money laundering". Arkansas Times. Retrieved January 12, 2012. ^ Abramson, Andrew (March 10, 2011). "Palm Beach Atlantic University appoints vice president to fill top job temporarily". Palm Beach Post. Retrieved January 12, 2012. ^ "William Fleming named PBA President - Palm Beach Atlantic University". Retrieved June 14, 2015. ^ "Rinker Athletic Campus - Palm Beach Atlantic University". Retrieved June 14, 2015. ^ "404 Error - Palm Beach Atlantic University". Retrieved June 14, 2015. ^ "Best Colleges". US News & World Report. Retrieved June 14, 2015. ^ "Live, From West Palm Beach, It's Commencement - Palm Beach Atlantic University". Retrieved June 14, 2015. ^ "Jennifer Rothschild - About". Retrieved January 14, 2017. Paul W. Beasley. Guided By God's Hand: PBA's First 35 Years. (Atlanta: Crux Communication, 2003). Donald E. Warren (2009). Miracles & Wonders: A Chronicle of Palm Beach Atlantic University. Palm Beach Atlantic University. ISBN 978-0-615-32688-7.